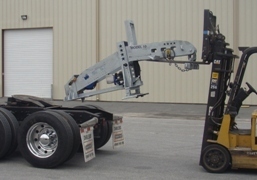 The New Model 20 5th Wheel Towing Boom converts any standard fifthwheel road tractor for towing service at a moment’s notice. With 20,000lbs of lifting capacity and 40,000lbs of pulling capacity, this super duty wrecker unit is twice as powerful as our Model 10. 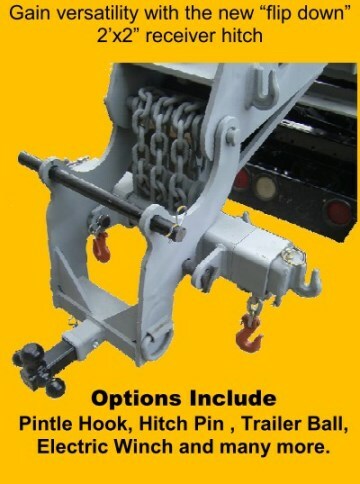 Featuring a massive 12" X 12" boom, this super sturdy unit easily pulls the larger vehicles such as dump trucks, drilling rigs, concrete mixers and large buses. Perfect for salvage operations turning scrap into gold or recovery for fleets with larger equipment. 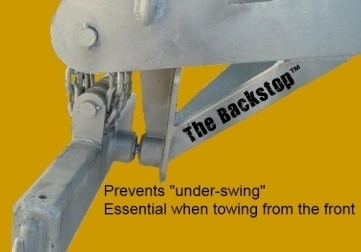 Also makes a great addition to any heavy duty wrecker service fleet. The Model 20 Deluxe comes electric/hydraulic/remote control with an onboard built in battery system and the Backstop™. Installation is easy and only takes a few minutes. Included angle iron is inserted into precut slots for forklift installation or you can use the heavy duty center mounted D ring for lifting with an overhead hoist.